Samsung Galaxy S5 smartphone definitely has a lot of imperative things to offer, so we should make the most out it. One of the many important features of the GS5 handset is the fixed dialing under Call Restrictions function. When enabled, this feature will let you choose certain numbers for emergency calls. 1.1. Press the Phone icon from the Home screen. 1.2. Touch the Menu icon (represented by 3 vertical dots) on the upper-right corner of the display. 1.5. Touch on More Settings to continue. 1.6. Wait for a moment until the current settings are displayed. 1.7. Touch on Fixed Dialing Numbers. 2.1. Under Fixed Dialing Numbers screen touch to select Enable FDN option. Doing so will turn on fixed dialing feature on the phone. Hint: You will know if the feature is enabled if it says "Disable FDN," otherwise it says the opposite. 2.2. Type in your PIN2 and touch on the OK button to complete action. 3. Go back to the Home screen. Just press the Home key to do so. You now have the fixed dialing mode turned on or enabled on your Samsung Galaxy S5. 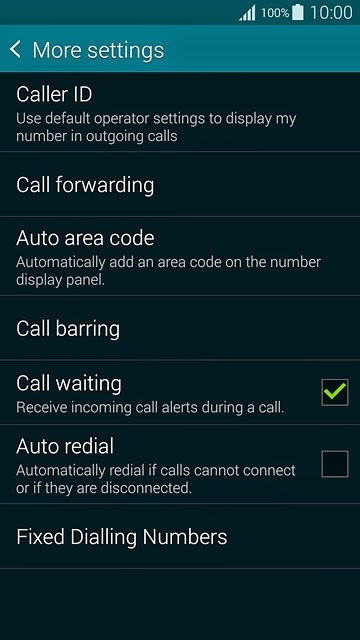 Turning on of the dialing mode will not affect incoming calls.